Surveys are great for quickly collecting large amounts of data about your users. At Envato, our design team creates surveys so we can gain valuable insight about the way people use our product. But preparing a great survey is challenging—writing good questions takes time, and the results can often be disappointing. Here’s how we used to create surveys: we’d jump straight into writing questions. Our colleagues and stakeholders would give us feedback on the questions without a true understanding of who the survey was for or what we wanted to learn. Before long we’d have a 20-question, difficult-to-complete monster of a survey. The results would be just as bad: difficult to understand, with no clear insight. 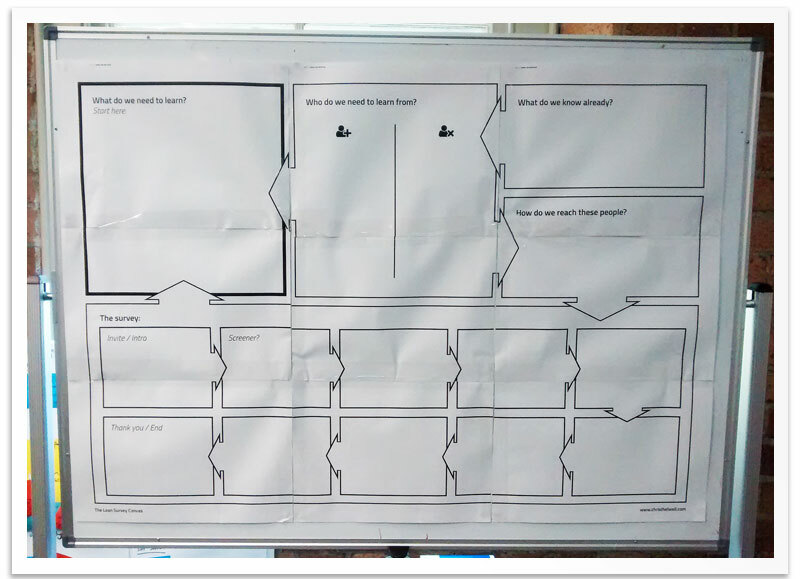 So we created The Lean Survey Canvas to help us prepare better surveys faster (in just a few hours). It allows everyone to collaborate around a single source of truth with all of the information at hand. We now focus on the insight we need for validating our hypotheses rather than writing questions. The result is a more concise survey (under 8 questions) that’s much easier for the participant to complete with clear, actionable insight from the results. 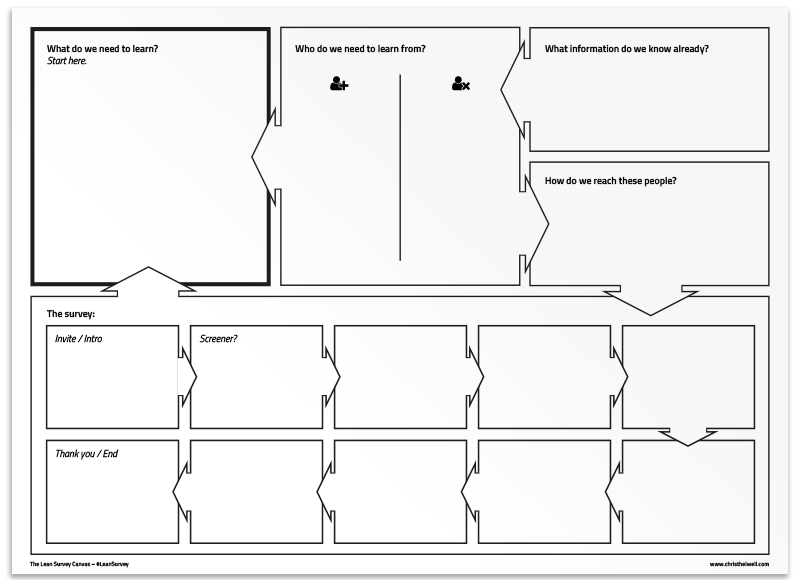 Download The Lean Survey Canvas template (opens PDF). The canvas is a non-digital process designed to evolve a great survey in a fast, lean, and iterative way. It’s best completed as a group (make sure you include all the important stakeholders), but you can also work on it by yourself. Print out the canvas as large as you can and stick it on a wall. You’ll need Post-it notes and spare sheets of paper to allow you to move things around and adapt as you explore the survey. Follow the order indicated in the diagram above. You’ll find yourself jumping back and forth as you discover new ideas and discard previous ones. Avoid writing any questions until you’re happy with the flow of the whole survey—you’ll find that most of the questions you come up with aren’t needed. Pro tip: Start by writing notes for each section on separate sheets of paper (allowing you to create as many ideas as possible) before mapping it out onto the canvas itself. Before you start, decide if your survey will be strategic or tactical—otherwise you won’t get the results you need. A strategic-focused survey helps you build a better picture of your user and enables you to make better decisions about the future of your product or service. It’s worth asking all the stakeholders involved about what output they need from the survey results. 1. What do we need to learn? This is the most important part of the survey, and the answers to all the other sections on the canvas should relate back to this. You can use questions or assumptions here or a mix of both. To help you decide, consider the output you need from the survey and how it’ll be used. What do we know we know? Do we need to confirm any of our existing knowledge? What do we know we don’t know? What questions do we need to ask to find out the unknowns? What don’t we know that we know? What assumptions do we have that we could validate? What don’t we know that we don’t know? Who should we speak to to find out more? An example: the design team at Envato uses a couple of survey formats more than others. We use a Jobs-To-Be-Done survey to find the right kind of people we need to interview and an Outcome-Driven Innovation survey to tactically discover the right features to build next. In our Jobs-To-Be-Done survey we seek to validate our assumptions about the jobs our users hire our product for and discover who the interesting users are that we want to interview (those with the best stories). 2. What information do we know already? Ask what you need to do to get this information and create actions to get it. Pro tip: Use a different color Post-it note for recording these actions on the canvas. Another example: by adding data such as lifetime value or revenue per customer to the results of the survey, we can see which people to invite for interviews based on their value as customers. 3. Who do we need to learn from? Next we need to define the people who will complete our survey. List out the characteristics of the ideal participant, plus a list of the types of people you don’t want. For instance, you may need a regular or a new buyer, but you may want to avoid people you’ve already surveyed or those who haven’t opted in to emails. 4. How do we reach these people? Make a note of the channel you think will reach the people you need. Also consider things like incentives or any split tests you want to do and details like timing and reminders. Pro tip: We use Post-it notes in different colors to show any actions like getting a list of users with the right attributes created. Now for the hard part. But thanks to all the sections you’ve already completed, it should be much easier. If you didn’t generate lots of ideas while going through the previous steps, take some time now to brainstorm as many questions as you can. Go through each group, and ask “Does it answer one of the questions set out in step 1?” Get rid of those that don’t. If it answers more than one, see if it’s possible to split the question. It’ll be easier to understand the results if each survey question relates to a single learning. Any learnings missing from step 1? Try to get some ideas for every answer. Write a single question for each group. You’ll need to combine and rewrite questions again and again to make sure you get the most out of each question. Do you need to capture important information (e.g. their contact details if you need to get in touch with them)? Order survey questions so they tell a story. This will help the recipients complete the survey easily as it builds on the detail as they go through it. Aim for about 6 or 7 questions in total. Any more and you’ll see a much lower completion rate. An example: we wanted to know if our buyers bought from us as freelancers or as part of their job, and if there was a client involved. Once we’d written the obvious question and answers, we challenged whether it made sense, if it was easy to answer, and if it really answered the question we had. We rewrote the whole question to focus on whether people bought for themselves or their employer and if someone else paid for what they bought. Next you need to write the ending to your survey. This is the message the participant sees after completing all the questions and giving you the insight you really value. So don’t forget to thank them and let them know what you’ll do with their information. You’ll also need to include any details of the incentive, if you offered one. As a group, you’ve created your canvas. So now go back through and make sure it makes sense. Ask someone who isn’t part of the group to take a look through the canvas and check with them that the survey answers the questions set out. 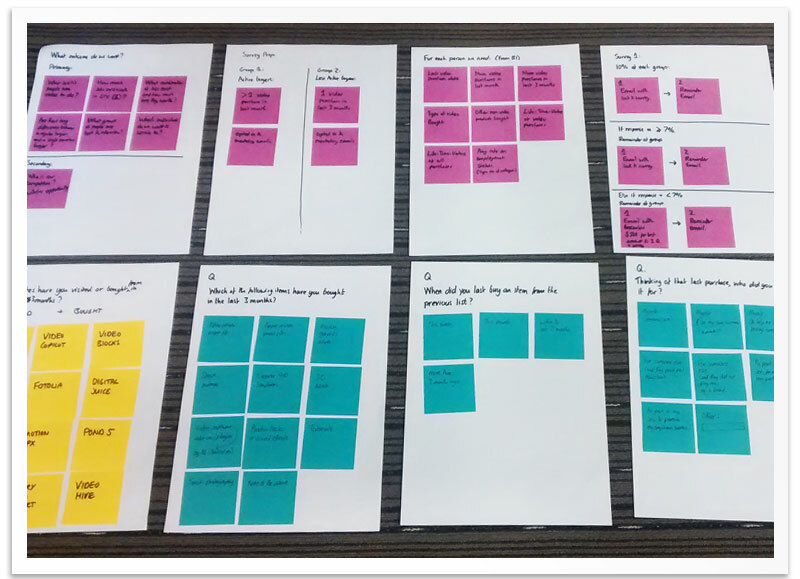 Iterate a few times to get it just right—that’s why we used Post-it notes! Now you’re ready to send your survey out to your participants. However, first you’ll probably want to get it written by a copywriter in the correct tone of voice. You may also want to test the survey internally. Tools like Google Forms are perfect for these quick tests. If you make any changes, update the canvas. Next, it’s time to set the survey up and send it out. Survey tools like Typeform, Formstack, or Survey Monkey make creating surveys quick to set up and easy to send. When choosing a tool, consider how the data comes back from the survey—not just how good the survey looks. With The Lean Survey Canvas, you now have a great tool for creating surveys collaboratively and quickly. It’ll help you get a survey ready in just a few hours, with the whole team sharing the same context. 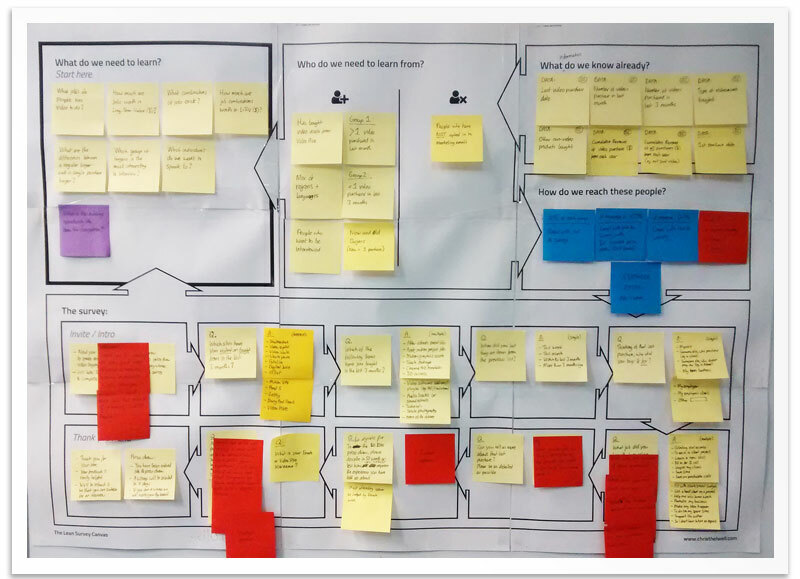 The canvas becomes an information radiator to use before, during, and after the survey, giving it a clear purpose which can be measured by the output it collects. Ready to give it a try? 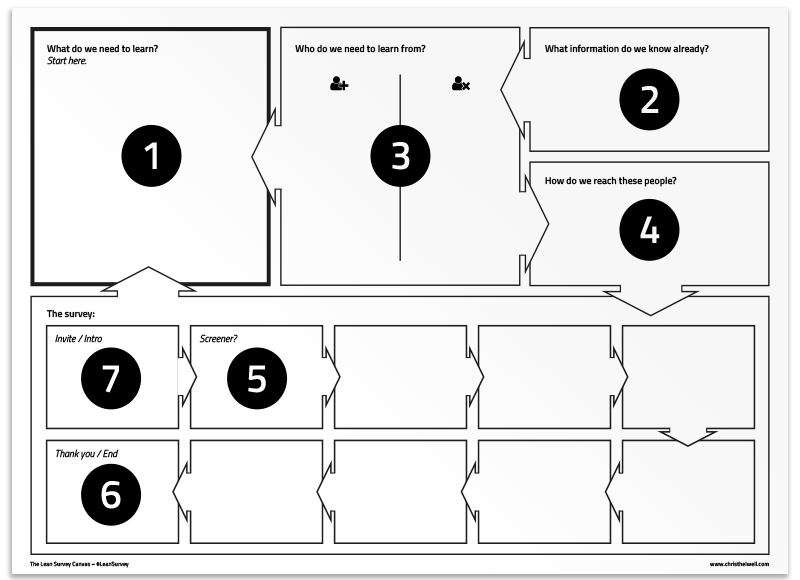 Download The Lean Survey Canvas template (downloads PDF).